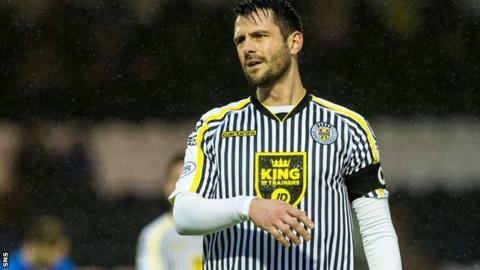 St Mirren caretaker manager Gary Teale wants to bolster his attacking options after skipper Steven Thompson was ruled out for at least three weeks. Former Scotland striker Thompson, 36, has had to undergo surgery on a long-standing hernia problem. "We've lost Stevie because he's had to go in for a hernia operation, which is a blow because he is one of our most influential players," Teale said. "We will just need to get on with it and try to get one or two others in." Thompson has already missed three months of the current campaign due to a groin injury. News of his lay-off is a setback for St Mirren, who are second-bottom of the Scottish Premiership, level on points with bottom club Ross County. "Stevie felt he needed to get it done," added Teale. "The best case scenario is about three to four weeks out. "We had a good talk about it. To be fair to Stevie, he has been carrying it for a while. He's been trying to play through it but it got to the stage where he feels he is only playing at 80% and he wants to get back to 100. "With where we are sitting in the table, it is not the best news." The Buddies have sent on-loan Manchester City duo Ellis Plummer and Adam Drury back to the Etihad Stadium, while striker Ross Caldwell has had his contract terminated by mutual consent, leaving Teale with money to work with. "I've got room to manoeuvre because the two lads have gone back to City," he added. "I've been trying to get folk in. I've got an extensive list and have been speaking to everybody and anybody down south. "It's proving a lot more difficult than I thought it would be because of the cross-border loan system. I want the players here for the rest of the season but a lot of English clubs are reluctant to let them come because they cannot recall them, which they can do if they are loaning to clubs down south. "But we've got a lot of irons in a lot of fires and hopefully one of them will pay off." Teale's side take on Aberdeen at St Mirren Park on Saturday, hoping to record their first Premiership win in Paisley since last May.